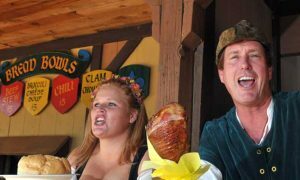 The Best Renaissance Festival in The Country! You’ve no doubt heard of a renaissance festival, and I’m sure the name alone gives you at least an idea of what it entails, if you’ve never been to one before. If you’re lucky enough to be visiting or living in the Charlotte area during early Fall, you should strongly consider checking this one out. 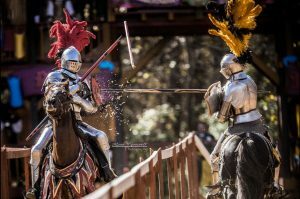 With an average of almost 200,000 people in attendance each year, the Carolina Renaissance Festival is one of the largest in the country! At the entrance, you’ll be welcomed into the mythical town of Fairhaven, where you will not only see and interact with many village folk like the Singing Milkmaid Trio and the Town Mayor, you’ll also have the option to play a part in their show! In Fairhaven, every visitor can choose to play their own role and interact with the characters, or simply sit back and watch the magic happen. This is a place where history and fantasy mesh together to create an encapsulated experience; Visitors will learn much about the true history of those who lived through the Renaissance period, and will also be surrounded by fun mythical creatures like Greenman – a talking tree, faeries and mermaids. 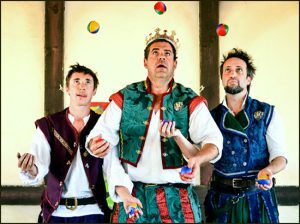 Daily activities like horseback jousting, circus-style entertainers, and comedy acts are all around. There’s music and dancing, and twelve stages for numerous acts to perform. If art and shopping local is your thing, you’ll be pleased with the many artists like potters, blacksmiths, candle makers, sculptors, jewelers, and a ton more that bring their fine craftsmanship to display and sell. Want to really be a participant in the whole experience? There are so many unique and one-of-a-kind games and rides that you just won’t find anywhere else. Ever ridden the world’s largest rocking horse? Or a camel? Thrown vegetables at a town peasant? (that one sounds a little mean, but hey, if you want to immerse yourself in the world of the renaissance, this is the way to do it). At the Carolina Renaissance Festival, you can do all of that and more. Do you vaguely remember learning at some point in your childhood that Da Vinci had a hand in creating some of the earliest flying machines, like the Ornithopter (this one’s history, not mythical believe it or not)? Well, here, you will have the chance to ride one. Maybe you’re not into all the games and the faeries…fine. Maybe you’re like me, and tend to slip out, “Will there be food?” as your first criteria question when someone invites you to any event, ever. If that’s the case, you’ll be more than happy with the answer: Oh, yes. Meat on a stick, what could be better? Soups, stews, and craft brews are also available, as well as other seemingly endless options…corn, potatoes, chili, mac and cheese, salads…even pizza. The shop that called out to my heart the most? The one serving smoothies and mimosas…the “Crown Pub”. Seriously, I couldn’t be happier with the menu if I had come up with it myself. Only open eight weekends of the year, Fairhaven awaits your arrival from now through November 18th. Take a trip back in time, but be sure to bring those new-fangled devices they call “cell phones” with you, so you can take plenty of photos and videos to share with us. See ours below from previous years!